Not a fan of brussels sprouts? This Brussels Sprouts Bon Vivant recipe will change your mind! Tender brussels sprouts are layered with a swiss cheese white sauce, sausage, stuffing, water chestnuts, and topped with more swiss cheese. 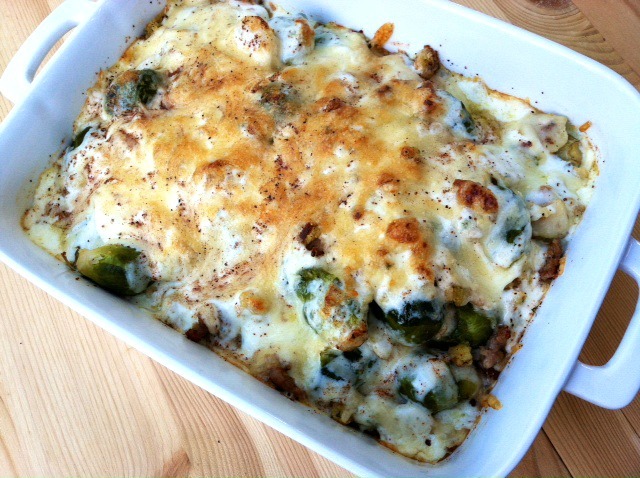 We love brussels sprouts at my house and this casserole is a big hit! It’s especially suitable for an Easter, Thanksgiving, or Christmas potluck. But really, it’s delicious anytime. Thank you to Joyce for sharing this recipe! Cook sprouts in salted water with grated onion and drain. Make white sauce by melting the butter in a saucepan over medium heat. Whisk in flour and cook for one minute. Whisk in milk and cream gradually, making sure that there aren’t any lumps. Continue whisking and cooking until white sauce is thick. Take off heat and mix in cheese until melted. Add nutmeg. Saute’ sausage and drain well. Add in cooked poultry dressing and chestnuts and sauté it with enough butter to coat it evenly. In a buttered baking dish, put half the sprouts, half of the sausage mixture, and half of the sauce. Repeat. Top with additional cheese. Sprinkle with more nutmeg. Bake at 400 degrees for approx. 30 minutes or until cheese melts and is bubbly.